For many, motorcycles are the ultimate expression of freedom – and for a good reason – it’s just you, the wind, and the road. Traffic jams are now part of your past and any time that was once spent on finding a good parking spot is now spent on the better things in life. A motorcycle can provide us with a special kind of independence that is easy to get used to. But even with that sense of freedom, eventually we find ourselves in need of a towing service just like any other vehicle. Considering we are dealing with a much lighter vehicle than the average car, we may be tempted to tow it on our own using a friend’s pickup truck or something of that sort. But like most things in life, and especially because a motorcycle means so much for us and our sense of freedom, it is important that when it comes to towing it you put that call to your friend on hold and use only professional towing services and call Newway Towing. 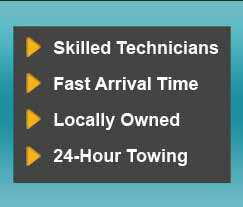 Newway Towing in San Rafael is a locally owned towing service provider. We provide our towing services through an affiliate network of independent tow truck operators, delivering fast and professional service. It may look easy, it may look intuitive, it may even feel like you know exactly what you’re doing, because after all – it’s your motorcycle, but it’s never that simple. And even though in normal days we would never consider coming between a man (or a woman) and their motorcycle, when dealing with towing – we insist on it. Because in case you don’t choose to leave it to Newway Towing’s professional team, there is an actual chance of damaging your motorcycle even further, which may lead to other, more serious malfunctions. So, no matter how “easy” it may look at first sight – leave the towing at the hands of professionals. Another worry you may consider while you are holding that call to your friend, is the quality of the service you may get, because an accident can happen anytime and anywhere. That is why you need a service that will not only be available 24 hours a day, 7 days a week, but will also be able to reach your location no matter where you may be in San Rafael and the area. Here at Newway Towing, we understand this, and being a local towing service company who is willing to serve our local community 24/7 is one of our best advantages. We are available for business constantly, including weekends, nights, mornings, and any other time of the day and week. Above that, being a local company in San Rafael allows us to foster great relations with the local community as they know they can trust us to be there for them on every call, and also to arrive at their precise location as fast as possible. Remember, when it comes to your motorcycle, there’s no way but New Way – call us now at (415) 870-3377.